PhotoImpact is a general-purpose image-editing program that Corel recently acquired. PhotoImpact has been on the market for more than a decade, and it has a particularly strong palette of features. You can use PhotoImpact (shown in this figure) for most digital photo editing needs. 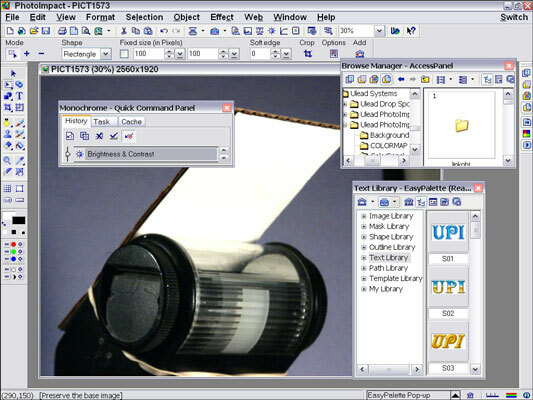 PhotoImpact offers a variety of image-editing options. A full assortment of brushes for painting, retouching, and cloning, as well as selection, cropping, and fill tools. PhotoImpact supports layers and includes a generous collection of effects filters. Auto-process commands are available to automate many of the most common image-correction and image-enhancement tasks. PhotoImpact offers a lot of what you get in Photoshop but for less than $100. PhotoImpact also includes some specialized features for creating Web graphics, including wizards that lead you through creating Web backgrounds, banners, and buttons. The PhotoImpact user interface is odd and inconsistent, and some features feel more like add-on modules than built-in components. PhotoImpact is a Windows-only program, so if you’re a Mac user, you’re out of luck.